Go ahead -- write on the wall. 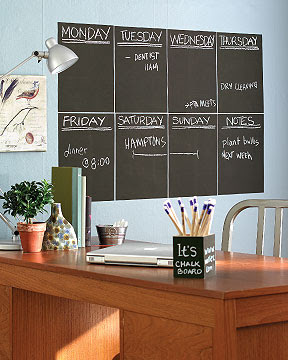 A pack of four removable, repositionable peel-and-stick chalkboard sheets is $17 from WallCandy Arts. Oooh...awesome! And easier than chalkboard paint. The chalkboard sheets are great! Such a fun idea. I found a similar concept to the chalkboards but they are on t-shirts. They are chalkboard tees handmade in Brooklyn that I came upon. Kids and adults can write/draw and erase. It even has a cool chalk pocket! I would definitely check them out.